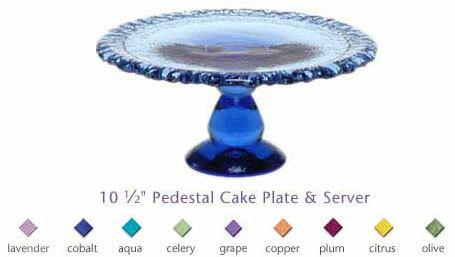 This pedestal cake plate and server is a great addition to any of the Fire & Light collection. Utilizing a once wasted resource... post-consumer recycled glass. All Fire & Light glassware selections follow both form and functionality. Fire & Light glassware is known for its vibrant color and texture. There is nothing else like it. Size:The diameter of the cake plate is 10-1/2" and stands just over 4-1/2" tall.